Tooth loss is not something that has to take down your smile, not anymore. While many of our ancestors experienced the literal loss of permanent teeth and the consequences of complete tooth loss, we don’t have to. First, we have more ways to preserve the health of our teeth and gums, which enables us to keep our natural teeth longer. Second, we have treatment options like dental implants to carry on in full form and function in the event we do need to replace a tooth. Even in the event of needing to replace a full arch of teeth, dental implants maximize outcomes. High-performance capabilities. Your natural teeth, they performed for many years without fail. The goal of tooth replacement is to restore performance as close as possible to what came naturally. Dentures have historically fallen short of this goal because they have no anchor point. The best that had been achieved – until dental implants – was the ability to increase stability using denture adhesive. 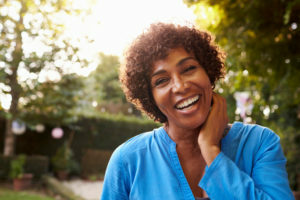 Just like natural roots, dental implants are anchored in bone; so, whether they are supporting a crown or full-arch dentures, they are capable of achieving optimal biting and chewing function. We are well aware of this little thing called tooth loss, and yet we still expect our natural teeth to last forever. Even if they don’t, it is possible to reinstate the permanence that lends to confidence. Dental implants can last forever when oral health is a priority. These fixtures become encapsulated in bone and have corrosion-resistant properties. No one wants to have replacement teeth that they have to spend a lot of time and care to maintain. Dentures are an example. These artificial structures seem relatively easy to clean because you just take them out and soak them, right? Not always. To fully inhibit bacteria, it helps to brush dentures with a special brush or cleanse with a special cleaner. The thing is, anytime a denture is removed from the mouth, it could be broken. A short drop from hand to sink is all it takes. However, dental implants are encased in the jawbone. To maintain the implants, patients should brush daily and visit the dentist routinely. Learn more about the value of dental implants. Contact Ridgeview Family Dental at 660-747-9117.